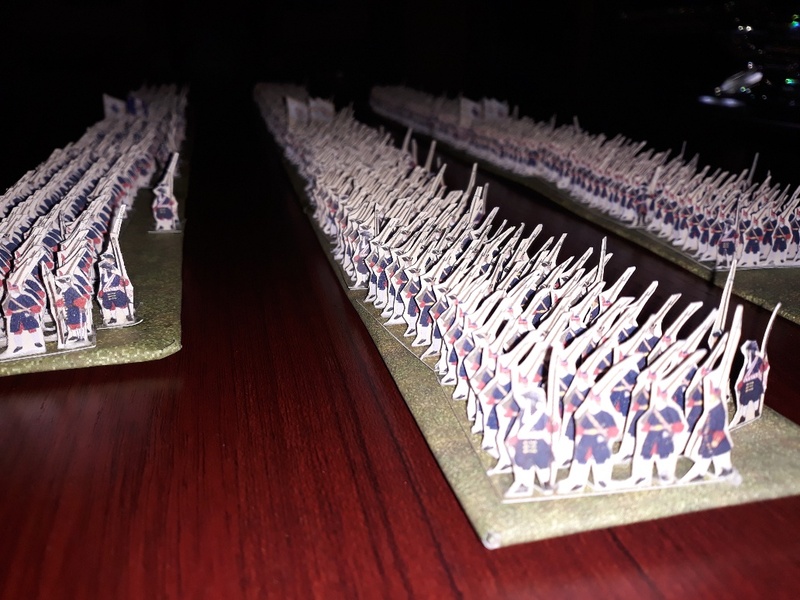 I come back to an old dream of mine: the assault of the Cutt's coloumn at the Battle of Blenheim, reducing the measure from 28 mm to 15 mm. The precision of the trimming of the papersoldiers is not as precise as in the other scale (i.e. 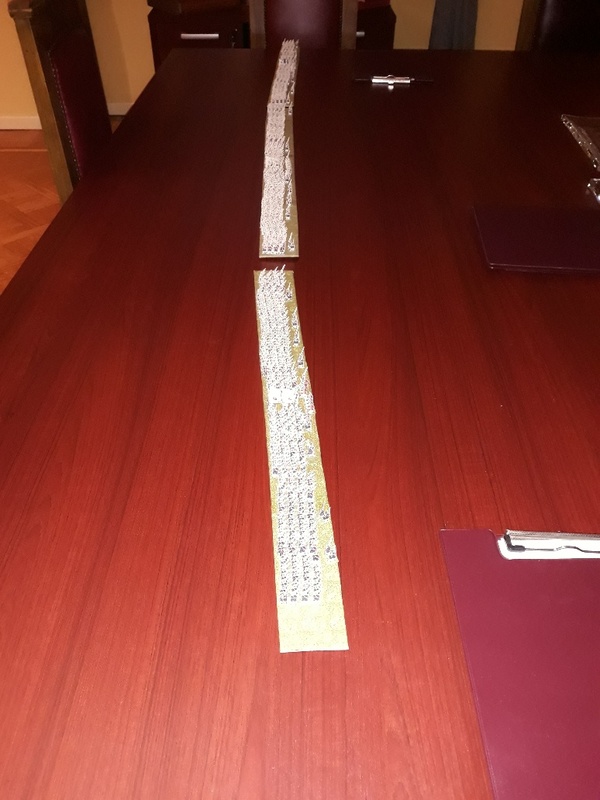 28 mm), but the total vision of the array is quite amazing, considering that the width remains the same. I started than with the Hessian - Kassel Brigade (second line) called the Wilke's Brigad, on 5 battallions. The usual order of battle for this brigade quotes every battalion to a 400 men force each. Obviously this was not the concrete case. I decided than to increase or decrease the numbers. For instance the Leibgarde Hessen Garde is increased to a total amount of over 500 men. Top: 3 battallions one after the other: Erbprinz von Hessen-Kassel, Leibgarde and Hessen Grenadiere Regiment. 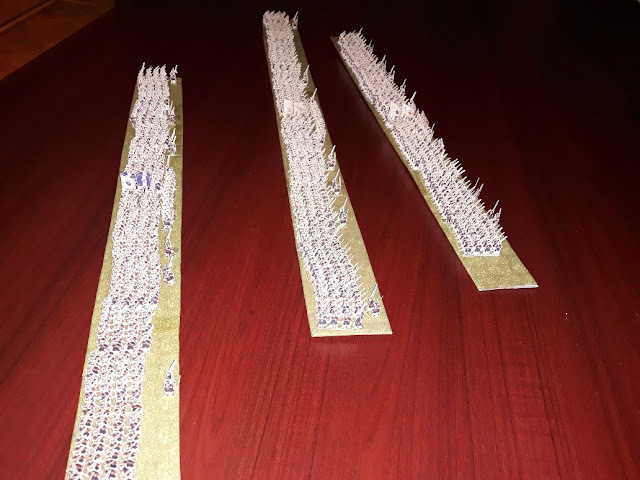 Around 1.500 papersoldiers. This scale is quite convinient considering that I can keep a rate of 140 papersoldiers/hour; this means that in a good raining day it's possible to create a 500 men battalion in one boring afternoon. Soon new battalions will be published. The idea is to recreate the entire brigade as a first step. This particular way of basing the papersoldiers allows to deploy a battallion in a quite short time (around some 40 seconds); then using the unique big green base it is possible ot move the battallion in one movement, but having the possibility (impossible with the other normal figures on the market) to split the battalion itself, for example for entering a village in a house-by-house fighting, or detaching a single unit for scouting or - for this period - grouping grenadiers to fight together. 2 stands will have the same as other, usually the center ones (o,85), etcetera. In this way also inside a battalion there will be a part higher morale and cohesion and a part with less, always insider a category (Elite 2).